New and Improved Citrus Magic from KKD. Whats new? The original Citrus magic rapidly became one of our best selling products due to performance and economy. When looking at ways to improve an already best selling product we looked towards increased economy, replacing some ingredients with friendlier and stronger alternatives whilst retaining the performance that was popular with trade and home users alike. 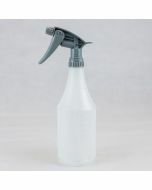 We have also retained the foaming agents that allow it a longer dwell time when applied by foam lance and also the bactericidal agents that target mold and algae that is common on soft top convertibles.